Today’s plant for #WildEdibleWednesday is Hamamelis virginiana, or Witch Hazel. There’s a good chance you’ve seen witch hazel tonic sold as a multipurpose astringent on supermarket shelves, and with good reason. Witch hazel is a highly useful edible and medicinal plant, made even better by the fact that it’s readily useful and identifiable throughout the year. Common throughout the eastern U.S. and Canada, witch hazel is a multi-trunked shrub with silvery-gray bark and alternate branching. The leaves are 2-6” long, oval, and have a wavy margin. It can be confused with Alders in the North and viburnum species such as Ninebark in the South, especially since it shares similar habitat with both. However, its flower and fruit buds at the branch intersections distinguish it from alders, and its asymmetrical, alternate branching helps differentiate it from the symmetrical viburnums. Witch hazel likes water. It is rarely found in upland areas, much preferring creek bottoms, riverbanks, and swampy areas. The creek bottom area at the SARCRAFT campus is completely choked with thickets of it in some areas. However, what really makes witch hazel unique is when it blooms. 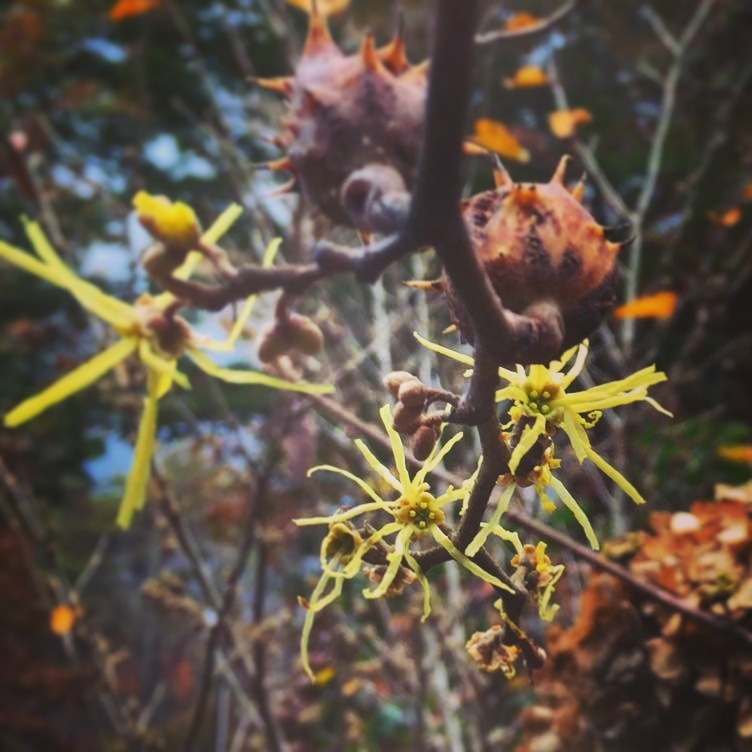 Unlike nearly all other plants which flower in spring or summer, witch hazel blooms sporadically from late fall through late winter, usually November through February in Georgia. Its bright yellow, spidery blooms stand out dramatically on a dead winter canvas of gray and brown. Witch hazel is also unique in that it has flowers and fruit on the plant at the same time – the tiny black seeds (about a quarter inch long) from the previous year’s flowering ripen about the time the plant flowers again. Although miniscule, the seeds are edible and high in fat and protein. When ripe, they are ejected explosively from the plant to a distance of about thirty feet. Even though they’re difficult and labor intensive to gather, these seeds can be a vital survival food source given the time of year that they’re available. Despite its many unique growth characteristics and edible seeds, witch hazel is primarily known as a medicinal plant. It has been used since time immemorial by native tribes throughout the Eastern Woodlands for treatment of, well… nearly everything. Its primary use has been as an infusion utilizing the inner bark. This infusion was used to treat internal illnesses such as colds, fevers, tuberculosis, sore throats, pneumonia, asthma, kidney problems, and arthritis, as well as external ailments such as bug bites, hemorrhoids, bruises, cuts, and scratches. Brewed strongly and taken in large quantities, the infusion also served as an emetic to induce vomiting. It was also commonly used as an astringent face wash for skin health, as it tightens pores and reduces redness – a common use for the plant even today. Oh, and about that weird name… why is it witch hazel? Well, there are two explanations. One is that it stems from the Old English word “Wiche” or “Wyche” (as in Wyche elm) meaning “pliable” or “bendable.” The second explanation, which is probably more likely (and way cooler) is that forked witch hazel sticks were the wood of choice for use as “witching rods,” or divining rods, for the practice of dowsing - “witching” for water. Most old-timers from rural areas can back this up – according to my grandmother, there was an old man in Cherokee County during her childhood years who dowsed for a living - that is, people would pay him to supernaturally find water so they could dig their wells. What wood was his divining rod made out of? You guessed it. Witch hazel.